The name of the game in world travel is being "fashionably light." Practice in 30-plus countries has taught me that packing minimalism can be an art. The incredible Sony VAIO VGN-TXN27N laptop. This beauty is less than 1" thick and weighs 2.8 lbs. If I add a few ounces of weight with the extended battery (on the right) and trick it out, I can get 15 hours of battery life. The name of the game in world travel is being "fashionably light." Hauling a five-piece Samsonite set around the planet is hell on earth. I watched a friend do this up and down dozens of subway and hotel staircases in Europe for three weeks, and -- while I laughed a lot, especially when he resorted to just dragging or throwing his bags down stairs -- I'd like to save you the breakdown. Trip enjoyment is inversely proportionate to the amount of crap (re: distractions) you bring with you. Practice in 30-plus countries has taught me that packing minimalism can be an art. I practice what I'll label the BIT method of travel: Buy It There. 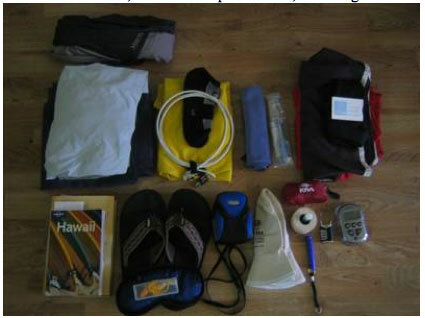 If you pack for every contingency -- "better bring the hiking books in case we go hiking, better bring an umbrella in case it rains, better bring dress shoes and slacks in case we go to a nice restaurant," etc. -- carrying a mule-worthy load is inevitable. I've learned to instead allocate $50-200 per trip to a "settling fund," which I use to buy needed items once they're 100 percent needed. This includes cumbersome and hassle items like umbrellas and bottles of sunscreen that love to explode. Also, never buy if you can borrow. If you're going on a bird watching trip in Costa Rica, you don't need to bring sunscreen -- someone else will be willing to give you a palm-full. -1 pair of polyester pants. Polyester is light, wrinkle- resistant, and dries quickly. Disco dancers and flashpackers dig it. -1 Kensington laptop lock, also used to secure all bags to stationary objects. -2 pairs of Exofficio lightweight underwear. Their tagline is "17 countries. 6 weeks. And one pair of underwear." I think I'll opt for two, considering they weigh about as much as a handful of Kleenex. One other nice side-effect of their weight: they're much more comfortable than normal cotton underwear. -1 Canon PowerShot SD300 digital camera with extra 2GB SD memory card. God, I love this camera more than words can describe. It is the best designed piece of electronics I have ever owned. I now use it not only for all of my photos and videos, but also as a replacement for my scanner. I'm considering testing the newer and cheaper SD1000. -1 Chapstick, 1 Mag-Lite Solitaire flashlight, and 1 roll of athletic tape. The last is a lifesaver. It's as useful as duct tape for repairing objects but gentle enough to use on injuries, which I am fond of inflicting on myself. -1 Lewis and Clark flex lock (for luggage, lockers, zippers, or whatever I need to lock down/shut/together). Standard mini-padlocks are often too cumbersome to thread through holes on lockers, etc. What are your favorite must-pack items, multi-purpose tools, and lightweight winners?